As the infamous floating “garbage patch” churns up bits of plastic in the tropical Pacific Ocean, a University of Washington undergraduate has discovered a related problem much closer to home: nearly invisible bits of plastic on Puget Sound beaches. 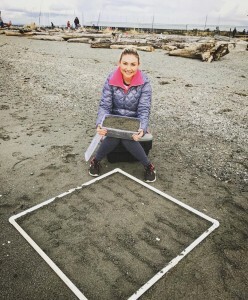 As a year-long project toward a UW bachelor’s degree, the oceanography major visited 12 beaches around Puget Sound to tally the number of microplastics, generally classified as fragments between 0.3 and 5 millimeters (1/100 to 1/5 of an inch) or smaller than a grain of rice. While she found all the Puget Sound beaches to be clean when compared with the Mediterranean Sea, local shores are far from pristine. Residents also may be surprised to learn that polar fleece and other synthetic fibers are the main source of plastic fragments on our beaches. As part of her senior thesis project, Eshom-Arzadon visited each location once at the same time in the tidal cycle between November and February. She scraped sediment from an area just below the wrack line, the line of debris left by the high tide. 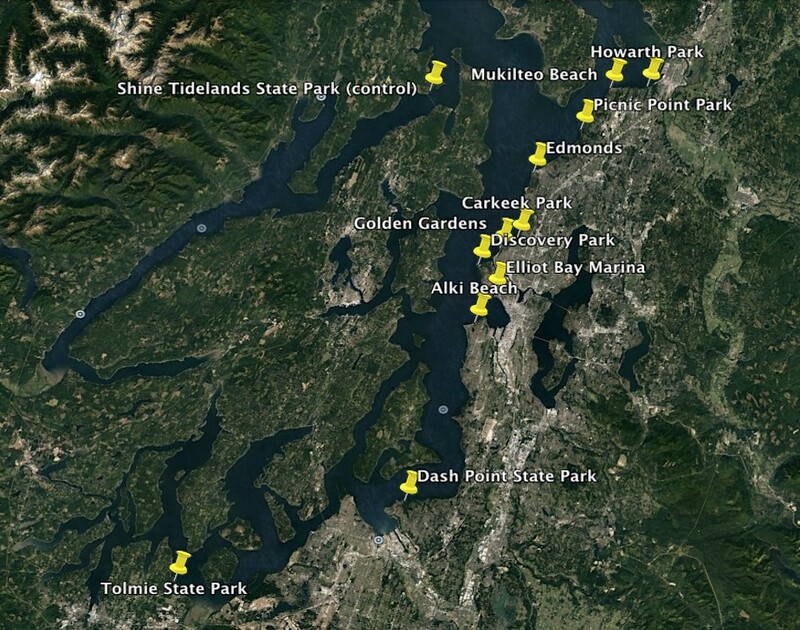 She visited beaches from Tolmie State Park near Olympia, along the Seattle and Everett shorelines and as far out as Port Ludlow on the Olympic Peninsula, a control site far from populated areas. Back in the lab, Eshom-Arzadon dried the samples, then used chemicals and weight-based techniques to separate the plastic from sand and other material. 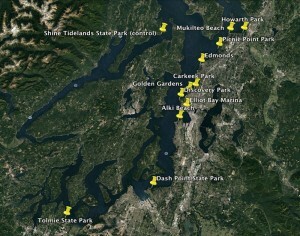 Her results show that small plastics are widespread along the shore of Puget Sound. All 12 samples contained microplastics, at an average of 1,776 pieces per 3-foot-square sampling plot. The highest concentration of plastics by number was at Howarth Park in Everett, followed by Carkeek Park and Alki Beach Park in Seattle. The cleanest beaches were at Mukilteo Lighthouse Park and Edmonds Marina Beach, both situated on points of land near ferry terminals. Her sampling methods followed the procedures established by Julie Masura, a UW Tacoma lecturer who has been tracking marine microplastics in the region for almost a decade. Eshom-Arzadon’s project included counting the plastic fragments and classifying them into six types: Styrofoam, fibers, fragments, flakes, films and synthetic sponges. 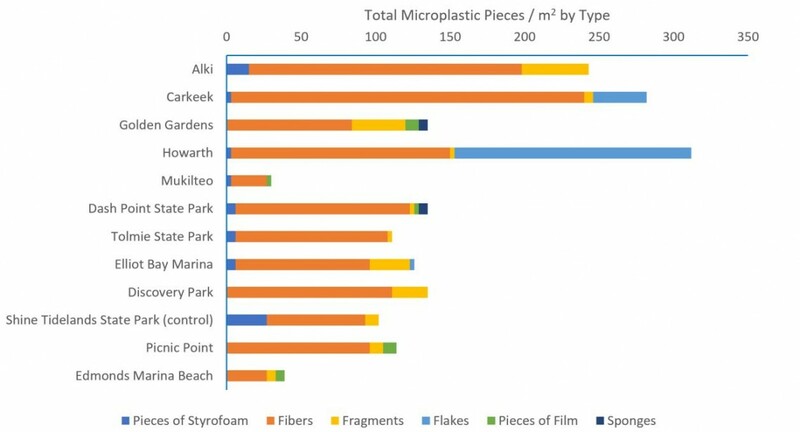 Some 73 percent of the pieces she collected on local beaches were microfibers. These thin strands are not from the breakdown of larger litter, such as plastic bottles or disposable cutlery; rather, they start when fabrics shed fibers that flow out with laundry water after washing synthetic fabrics, like polar fleece or other types of polyester. She noted that front-loading machines have been shown to generate fewer microfibers in washing water, while Patagonia and other clothing companies have recently begun efforts to produce synthetic fabrics that shed less fuzz. The average overall concentration of microplastics was slightly higher on Seattle city beaches, providing only weak support for Eshom-Arzadon’s hypothesis that microplastics would be more common in densely populated areas. But she and her advisers concluded that a one-time sample was probably not enough to properly rank the locations. Eshom-Arzadon became interested in this topic after doing an undergraduate service learning project with the UW-based Coastal Observation and Seabird Survey Team, COASST. 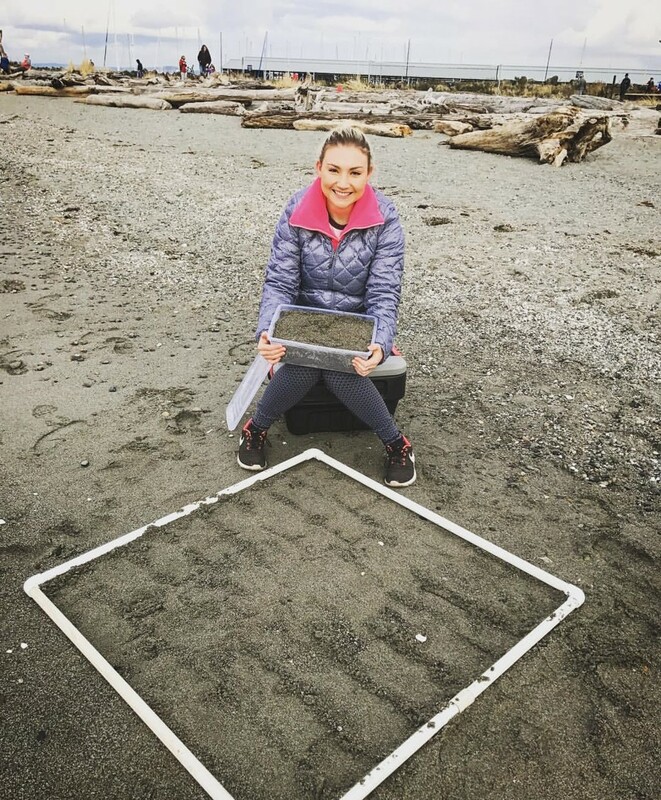 She volunteered to survey beaches around Seattle and her native Edmonds looking for stranded birds and marine debris. She also took an undergraduate class on marine pollution that included a section on marine plastics. Two other UW oceanography senior thesis projects this year also looked at microplastics. Ty Mahoney sampled microplastics in Hood Canal and faster-flowing waters around Whidbey Island, and found that the debris tends to accumulate in the more stagnant sections. Gerrad Hofmans sampled water from near the source of the glacier-fed Snohomish River down to its mouth in Puget Sound, finding that the concentration of microplastics increases on the way downstream. Those results could help inform the work of Masura and others who are trying to measure and understand plastic pollution locally. “As with many research groups, we find that plastics are quite prolific,” Masura said. Her group is working to develop an interactive map that will display the results of the samples collected with the support of government agencies, colleges, schools and nonprofits. For more information, contact Eshom-Arzadon at eshomf@uw.edu or 425-501-7018, Masura at 253-692-4317 or jmasura@uw.edu, and Newell at newell@ocean.washington.edu or 206-543-6119.